Mayor Bill de Blasio told St. Rita's Catholic Church on Shepherd Avenue in East New York that his plan to rezone the neighborhood would bring more affordable housing and help keep people in their homes, not force them out as some have feared. NEW YORK CITY — Mayor Bill de Blasio told a church in East New York that his plan to rezone the neighborhood would bring more affordable housing and help keep people in their homes, not force them out as some have feared. 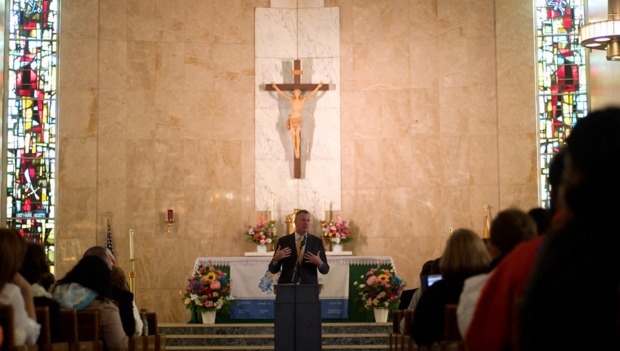 "This is my mission — to make sure the people who made our neighborhoods great can still stay in the neighborhoods they love," de Blasio said Sunday at St. Rita's Catholic Church on Shepherd Avenue. East New York is the first neighborhood targeted for rezoning under de Blasio's plan to create or preserve 200,000 units of affordable housing over a decade. There will be at least 1,200 units over the next few years in East New York, mostly for families making no more than $46,000 per year. But the fear from some in the neighborhood is that the new development, including buildings of at least 8 stories on Pitkin Avenue and other corridors, will change the face of the neighborhood, draw in people with higher incomes, and displace long-time residents of moderate and lower incomes. De Blasio told the crowd that wasn't going to happen. "I’m just not going to watch while hard working...people are displaced. I don’t find that acceptable at all. Our city government can ensure that working people have a place to live in their own neighborhoods," said the mayor. "We have to make sure that, even when things are changing, hardworking people are protected," he added. The success of the effort in East New York is crucial as de Blasio's rezoning and affordable housing plan seeks to emulate the effort in neighborhoods across the city, including Long Island City, the Jerome Avenue Corridor in The Bronx, Flushing West and the Bay Street Corridor in Staten Island. Development in those areas will be required to include affordable housing under what is called mandatory inclusionary zoning. De Blasio said residents will have more of a say in the rezoning effort than in the past. "Powerful developers will not decide the future of these communities. The people will decide, and the people will set the rules," the mayor said. Councilman Rafael Espinal, who represents East New York, attended the speech and said he was glad to see de Blasio out in the neighborhood talking about the plan. Espinal said the message from de Blasio was consistent with what the city has said all along. "He's going to make sure the tenant protections are in place and that affordable housing is affordable to the people who live there," said Espinal. But a sense of wariness from the community will remain until the final details of the plan are hashed out. The Department of City Planning presented the plan for the Uniform Land Use Review Procedure last month. "Everything looks great on paper but until it comes to fruition I can't say I'm supportive," said Espinal. De Blasio wrapped up his speech with what he called a "simple thought." "New York City cannot be allowed to become a playground for the rich," he said. "New York City must be a place for everyone."